Industrial canals allow boats and pipelines to pass through coastal wetlands. Coastal Louisiana is a landscape that bears the scars of the oil and gas industry. Oil refineries are mere blocks from homes, and chronic oil spills and leaks mar the water flowing through coastal areas. Oil is a part of everyday life for people in a state that saw its first oil well drilled in 1901. In June, my colleagues Nancy Pyne (field director) and Ingrid Biedron (marine scientist), traveled to the region to get a firsthand look at the effects of the oil and gas industry on the Gulf’s coastal residents and marine environment. With the threat of offshore drilling activities being expanded to areas like the Atlantic, Eastern Gulf, Arctic and Pacific coasts, they wanted to find out what might be in store for our thriving coastal communities. Their visit included a flyover of the Gulf with watchdog Jonathan Henderson, founding president of Vanishing Earth. The sight of the scarred landscape moved Pyne to tears, she said. On average, Louisiana loses a football field of wetlands every hour. In situations like hurricanes, this loss can increase to hundreds or thousands of football fields. While wetland loss has occurred for thousands of years in Louisiana, it has, until recently, been balanced by various natural wetland building processes, according to the Coastal Wetlands Planning Protection and Restoration Act. Human activities have caused the wetlands to be lost faster than they can rebuilt. For example, to transport oil to refineries, the oil industry dredges straight channels across the wetlands to allow boats and pipelines to pass through. These straight channels allow saltwater to flow more easily through the marshes, destroying the freshwater vegetation that keeps the soil in place. “The legacy of oil company exploration and development in the wetlands has just sliced and diced our coast,” said Aaron Viles, a community organizer who Pyne and Biedron met in New Orleans. Viles is the manager of organizing at Care2 and board chair for the Gulf Restoration Network. “An enormous amount has been lost and it continues at a pretty outrageous pace even despite lots of recent efforts to do more to restore and rebuild these coastal wetlands,” he added. Disasters like oil spills can also impact wetlands loss. Viles remembers when the BP Deepwater Horizon oil rig exploded, killing eleven workers and gushing gallons upon gallons of oil into the Gulf of Mexico. At first, he didn’t think much of it – sadly, oil spills are all too common. However, it was soon apparent that this was not a typical oil spill. By the time the well was finally capped 87 days after it exploded, over 200 million gallons had gushed into the Gulf. 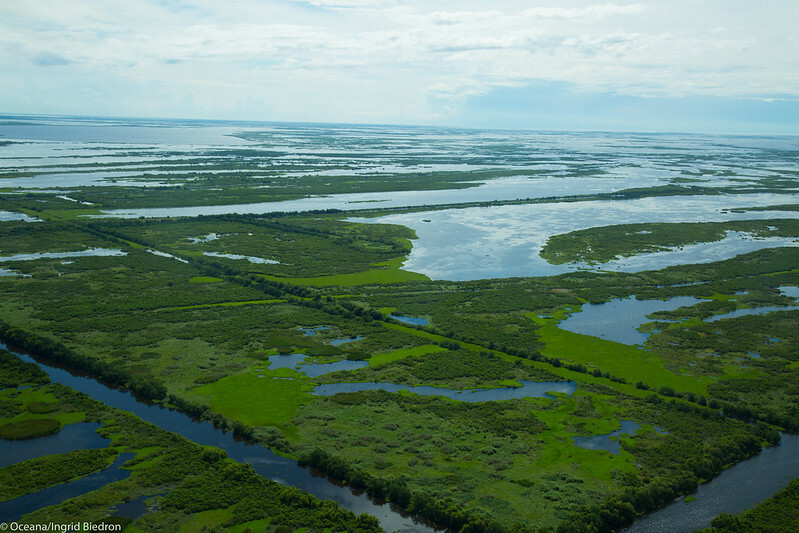 A study later showed that the BP disaster also accelerated wetlands loss in some areas. A few days after the drill rig exploded, Viles flew over the Gulf with the Southwings volunteer pilot group to inspect the damage. The reddish-brown oil slick was about ten miles by twelve miles in size, by the time he flew over it. “It was pretty disturbing to see how far the oil had spread already and there were such wholly inadequate measures being taken to try to control, contain and clean up that oil,” he added. By 2020, the impact of the disaster could total $8.7 billion dollars, including the loss of 22,000 jobs related to commercial, recreational and mariculture fisheries in the Gulf, according to an Oceana report that highlights the impacts of the Deepwater Horizon disaster. But even before the BP disaster, the Gulf’s coastal residents were already experiencing the consequences of offshore drilling. When Louisiana native Casey DeMoss was younger, her family traveled to Galveston, Texas, to play on the beach. But before she could get back in the car, her parents had to scrub the tar off the bottoms of her feet, the result of leakage from offshore drilling platforms. “I thought it was a normal thing,” recalled DeMoss, who also met with Pyne and Biedron on their trip. Fast-forward to today, DeMoss is now working on a book about energy policy under the Trump administration. And for almost four years, DeMoss served as the assistant director of science and water policy at the Gulf Restoration Network, working there when the BP disaster occurred. After the disaster, two BP executives received large bonuses, while many coastal residents who relied on the Gulf for their livelihoods had to go on welfare assistance, DeMoss said. Next week, we will meet Peg Howell, the first female oil “company man,” who went from working in the oil industry to founding the nonpartisan grassroots group Stop Offshore Drilling in the Atlantic (SODA). Her factual and emotional testimony comes from someone who understands the oil industry from the inside. Follow the Coastal Voices series at usa.oceana.org/Coastal-Voices – help us share their stories.